The State of Arizona votes this year on Super Tuesday, February 5th in what is called a ‘closed primary’. I’ve noticed that my previous post on other state primaries have been extremely useful for readers, so I’d like to duplicate this for residents throughout the country. Each post is assembled on the Voter’s Guide page for your future reference. The backdrop of Senator McCain’s historic run for president aside, Arizona residents are facing perhaps the most important presidential primary they have ever voted in. The nominations have never been so in flux in nearly a generation. Both parties do not have a clear winner, and each campaign is shifting their focus to a long term outlook. In fact, we might see both the Democrats and Republicans fighting this one out until the summer. 2008 therefore is no longer about Iowa and New Hampshire. It’s about Super Tuesday and the states that follow. And Arizona sits in a position of power to determine who the nominee may eventually be. In light of this, I feel it is necessary to share a quick history and voter’s guide to the most salient questions I’ve been asked about Arizona and Super Tuesday. A political professional for nearly 10 years, I hope that this guide helps to answer all of your questions. If you have further ones, feel free to leave a comment. Can I vote in the Arizona Primary? Only if you are a registered to vote prior to Monday, January 7th and are a declared member of either the Democratic or Republican party. At the time of this writing it looks like the deadline has passed for all of you who have not yet registered. Sorry kids. 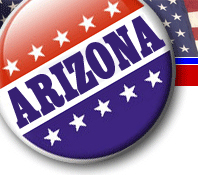 Can Independents vote in the Arizona Primary? Why can’t Independents vote in the Arizona Primary? The State of Arizona votes in what is known as a ‘closed primary’. This means that only those voters who have officially declared their membership in the Republican or Democratic parties may participate. Does the Arizona Primary matter? Despite Independent voters being barred from participating, the Arizona Primary still matters a great deal to the overall 2008 Election. When a presidential primary comes to a state like Arizona and the voting can still determine the outcome, it is a rare opportunity for voters to have their voices heard nationally. If you are a Democrat, your vote will contribute to your candidate’s delegate total when it comes to convention time. Even if your candidate doesn’t win Arizona, the better he or she does, the more delegates he or she will have to potentially be the nominee.